The cold temperature North Pole went for a ride, to the South and West, it also split in two as central Siberia is quite cold. There has been an onslaught of North Pacific Cyclones heading towards the Pole which warmed the Arctic considerably, it was much colder here a mere ten days ago. All this is deja vue, namely 2005 and 2006. 2005 beginning of December was bitterly cold in North America, yet it warmed up considerably after. 2006 had a similar weather gig, but it was much milder here. From what was gathered a few months ago, the heat is still around, despite an early winter cooling, which is merely a repeat of past years. The only reason to drastically change a projection is to claim the existence of a vast area of very long lasting stationary clear air in near total darkness, smaller very cold areas always happens at the end of fall, right now this not so small area is over the Northwest Territories/Nunavut border in Canada, the present location of the North American minimum temperature North Pole, which has its own cooling feedback system assuring a life of several days, no clouds-more cooling, the exact opposite of hurricanes, it will die if it gets over a warmer spot, like a rather large ocean. a place with high sun elevation or it can go back where it came. October 2007 temperature anomaly is standing #2 worldwide, Northern Hemisphere #4 at +1.03 C behind 2006, 2005 and 2003 respectively. January to October NH anomaly stands #1 above 2005 at +1.05 C by +0.04 degrees, on track to exceed 2005 +0.99 Cyearly record. A fall anomaly "moisture" temperature boost has happened strongly over the past 3 years. When humidity transformed itself into heat after a lot of rain prompted by the lowering sun. It appears to be an emerging pattern, distorted this year by the massive amount of heat necessary to melt millions of square Kilometers of ice as with the great Arctic summer ice melt of 2007. As the ice reforms over the Arctic Ocean, not so small heat should be returned to the atmosphere, I have not noticed this here in Resolute because we are near the cold temperature North Pole, but sun disk measurements, not inclined to follow surface temperature trends say otherwise. Fall of 2006 High Arctic was remarkably warm, a precursor for the great Arctic Ocean ice melt of the summer of 2007. Left is evidence taken september 23 2006, as seen by a sun disk under a tropopause 11,267 meters high. Temperature on the ground was a mild -2 C. There was a week inversion something that didn't happen until the last day of September 2007. Comes the fall of 2007 a day or so after the end of the great melt, September 21 disk shows remarkable expansion compared to just a year prior. There were no surface inversions, just an adiabatic lapse rate at 10 C/km. Although the surface temperatures were alike, the greater pressure in 2007 should have shrunken the sun further, that was not the case. The atmosphere was very much warmer than in 2006 at about the same date. A blitz in cold air at the very end of October 2007, didn't come as a surprise. The last packice of the great melt survived near by. It combined with Greenland to form the Minimum temperature North Pole. We are about the coldest place in the Northern Hemisphere right now. 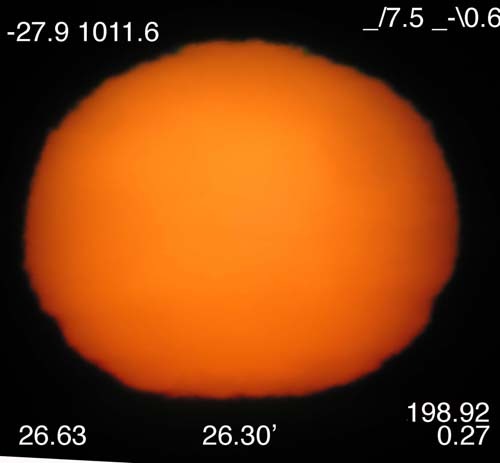 There was an important inversion seen by the flatness of the sun's lower limb, -27.9 C may be cold on the surface. Yet, despite being shrunken by a mirage this sun disk is still bigger than September 23 2006 shot. Meaning: It's getting colder here by darkness, but from a very warm starting point, we are also at the coldest place possible. The rest of the atmosphere away from here is just as warm if not warmer than 2006. Not seen here, September's lower atmosphere strong warming has moved upwards somewhat from zd 88-90 to 85 - 88 degrees. So strong is this warming in altitude that there is no difference in differential refraction observations between September just past and this October. This implies that new ice is starting to cover a great deal of the sea. The graph above shows that October 2007 has been warmer than October 2005, however some readings in October 2006 were warmer. This is not a surprise, October 2006 was incredibly warm. Since sun disks are about the same as 2006, despite the persistent cooler weather generated by North of Alaska Anticyclones, we are at this time, near a zone of near stagnant air, where mixing is highly localized around the Minimal temperature North Pole. This scenario is a repeat of last March, with extra heat octane from the open Arctic Ocean. Projections from this scene, are based on the coldest possible clear air giving remarkably weak compressions, 2006 shots were fewer in between great periods of cloud cover. From these facts, there is no change in prognostications, the trend is still for the warmest winter in history to occur, with a switch for those living nearest to the Pack ice- Minimal Temperature North Pole area having slightly above or plain seasonal temperatures. Particular effects of the immediate above the horizon Upper Air refraction temperature transects between Zd 86 to 88 degrees. What is seen is a jump in temperature preceding the big ice melt by 2 years, and what appears to be some cooling in 2007. But a vastly greater warming is happening from the surface to zd 88 degrees right now. What this graph depicts is a significant Upper Air profile switchover from mainly surface based inversions to relatively steep adiabatic lapse rates from surface to the Tropopause. 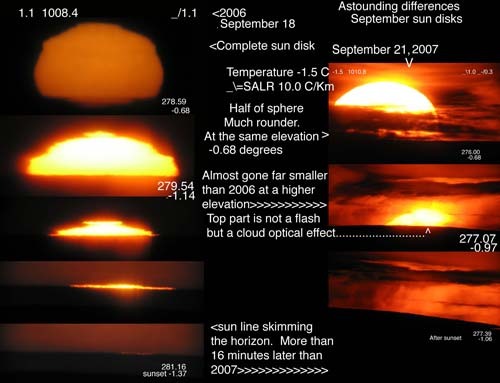 The weighted net temperature gain from the surface is not calculated here because a balancing act made by strong warming on the surface counter weighed by steep adiabatic cooling aloft, very close to the horizon sun disks have the unique characteristic of representing the air right above the surface, further above sun disks depict a mix between the entire troposphere and a bit of the stratosphere, zenith sun disks capture an almost 50-50 mix between the stratosphere and troposphere temperature characteristics. However, this current surface warming will eventually make its way in the Upper atmosphere. At this time EROAM formula is not calibrated to calculate total temperatures at zd’s greater than 88… September at horizon sun disk observations have showed an explosion in sun disk sizes, the net temperature impact trend should be greater than the 2004-05 jump, which was many times the worldwide decadal trend temperature increase of +0.2 C per decade. Arctic Amplification explains some of this strong trending, other possible factors have not been clearly explained . EROAM has not been peer reviewed yet, but its results are consistent with the recent great Arctic Ocean ice melt. What does this mean, or what is the greater picture? Usually, Arctic surface warming has a direct impact in Southern temperate surface temperatures, much more so than if the warmer air is aloft. The ongoing energy gains by vast areas of Arctic Ocean open water can therefore be felt everywhere Southwards, establishing 2007 as the warmest year in history for the Northern Hemisphere. The cooling in the Arctic Upper Atmosphere has other implications which will be discussed later, since it affects glaciers more than anything else. A continuance of persisting horizon heat is seen here. Whereas 2007 sunset terminated earlier to the Southwards when just back in 2006 at about the same date cold air elements were still quite visible due to sunset distortions. The atmosphere itself has changed to a more adiabatic one, approaching or surpassing the standard adiabatic lapse rate of 9.6 C/Km. Inversions give distortions, now with ocean ice removed there is no semblance in sun disk geometry all within one year. But the changes are mainly at the near surface level, creating in itself weather not familiar to the high Arctic. The single largest expanded sun disk from below the horizon in the high arctic (below 0 degrees elevation). 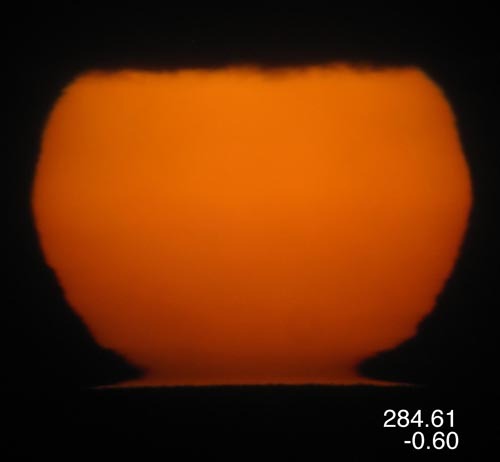 The sun vertical diameter grew as it got closer to the apparent horizon. An ordinary inferior mirage sunset, first one ever filmed here. The disk was above sea water with very little or no ice. Likely the sea surface was just as warm or warmer than the air just above. This is a typical southern coastal sunset in the absence of ice, its foreign to the high arctic. Extraordinary blue flash. But wait, something is wrong, the flash doesn't immitate the hill slanted horizon. Again a first. With the presence of a very cold surface this flash would have been bent in the same direction as the hill. There is no snow on the ground, more than 2 weeks late. Northern Hemisphere August 2007 surface temperature anomaly by a mild +0.94 C makes August the warmest in history according to NASA GISS. August was tied for #1 warmest worldwide as well. Thermal dynamic law of conservation of energy trumps all, as expected, 2007 is almost certainly the warmest year in history for the NH. After a brief cooling during June and July, excess heat is showing itself retransformed to its lower sun elevation state after hiding itself as water vapour. Tales of 3 pictures at the same Astronomical location. Massive changes are taking place in the High Arctic. The all time low Polar ice extent is not the only event. The combination of seeing and measuring climate change simultaneously is done convincingly here. The severely compressed sun disk on top is seen whole, ovoid CFL football like (NFL for Americans/Europeans!) . 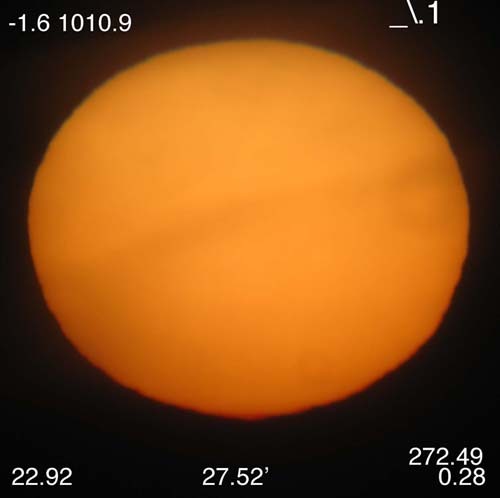 This was taken during the warmest year in history, April 6 2005, that was a normal Arctic sun, seen by people and explorers alike over many centuries. 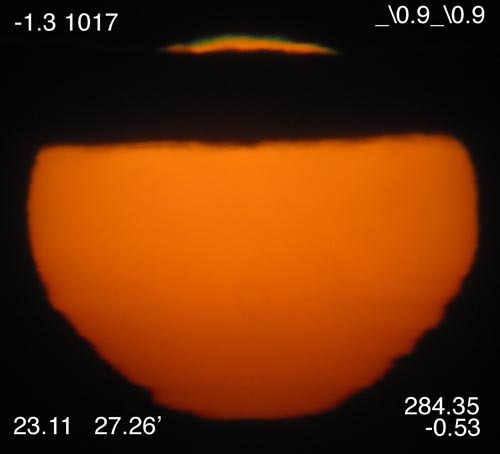 The Sun disk in the middle is much rounder, partially submerged below the horizon and not whole, because there is less refraction, it was taken at nearly the same astronomical location, from the same camera spot on September 6 2007. This sun disk has nearly twice the vertical diameter as the one above. Horizon suns are a rare sight. The Arctic fall is usually too cloudy, this was a chance to see what is going on. 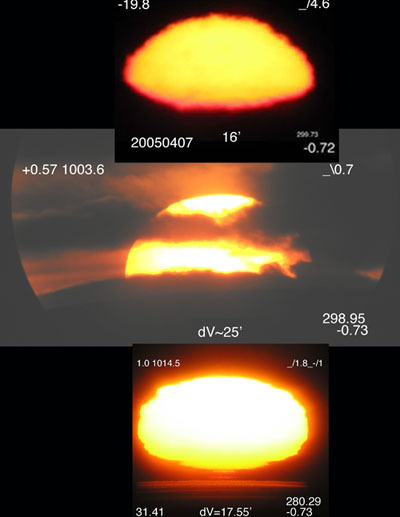 Preceding years horizon suns in September were more compressed, as per lower picture, almost as much flat as April 2005 on top, the lower picture is a complete sun disk before sunset on September 18 2006, it was almost as flat as in 2005. Now, take a closer look with a sun disk at the same elevation as in 2007 in the middle, the difference is staggering, 2006 had a very warm fall, 2007 looks very much warmer. I expected some changes, but, sphere like 2007 shot was a surprise. Only in a Southern location can a sunset look like a descending sphere, in the high arctic, until September 6 2007 this was true, that’s history now. 500 observations have shown a certain degree of cooling near the surface of Montreal, while in the Upper Air strong warming. NASA confirms this. While Northern hemisphere July dropped to #5. NOAA Upper Air RATPAC ranks July as #4 warmest. It is especially gratifying that sun disk observations at one single location has confirmed what powerful networks and satellites have recorded. But the end game at least for the Gulf of Mexico is Sea surface temperatures (SST) being almost identical if not warmer than with 2005. Click here. 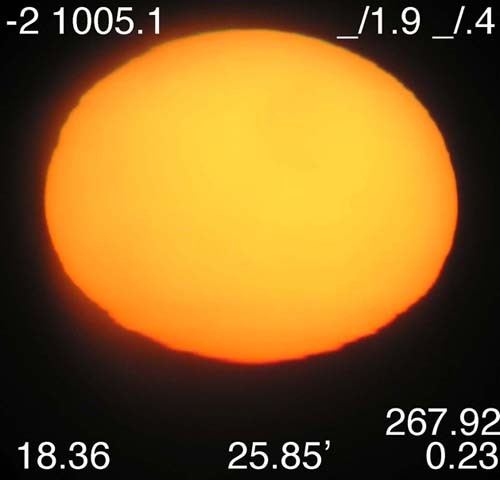 The break down of sun disks observations will come soon. In the mean time, what is going on? Using the sun has a fixed sphere of reference has once again given results, NOAA confirms January-May 2007 warmest in history for the Northern Hemisphere. Unless there is a radical geological event, it seems unlikely that 2007 would not be #1 warmest beating 2005. Observing in Montreal (a beautiful city with a mountain at its center), is giving similar results where increasing number of sunsets are shifting southwards, just like small but impressive Resolute Bay (an arctic village by a plateau). This implies a gradual world wide sunset shift to the South. Other observatories must confirm this shift. In science repetition is a standard, someone else must observe this trend elsewhere. Once this is done, this phenomena becomes a significant news event. Global Warming has other implications beyond temperature changes, it means amongst other things shorter days especially for people in higher latitudes below the Arctic circle. The cold air North Pole as discussed before shows remarkable resilience, always maintaining its position despite the onslaught of the higher sun. Its effects during the coming summer is obvious, clashing air masses causes precipitation, as the cold holds its ground, there should be more unstable air in the North American sector. The only way around would be a complete change in the atmospheric landscape, I don’t see this coming, except for cooler sea surface temperatures, it’s the summer of 2005 all over again. Fascinating, there was two consecutive Cold North Poles, as discussed below, as some weather experts may have noticed, one in 2006 , Central Russia-Eastern Europe. 2007 was in the West Greenland-Canadian Archipelago-Alaska triangle. While everywhere else around had above normal temperatures. What seems to be happening is a mirror of the Stratospheric Vortex. Where there is a High pressure below the vortex center, and especially no surface winds at about the same location. In the stratosphere a massive low with hurricane winds rages during the long night, while, in the troposphere there is a massive cold temperature sector (not always recognizable as a High). As discussed below, there was a cold genesis in March 2007, when somewhere in the Arctic a very low tropopause subsisted, this is theoretically and ideal heat radiation escape to space. April 2007 saw this zone almost disappear, then in May it reappeared as some sort of memory from the imprint it gave to the ice and land in March. It is likely that advection stopped during May, leaving the cold footprint re-establish itself in the atmosphere . MIT’s Carl Wunsch proposed a memory for sea temperatures spanning a much much longer period, what we are experiencing is similar but the memory imprint is on land ( colder soil covered with more snow), sea, thicker sea ice, and of course within glaciers however big or small. This leaves a lasting atmospheric temperature pattern. This "Cold" North Pole is within Canada nowadays, specifically over Northern Baffin Island. The over all picture is this: an increasing pattern is establishing itself during remarkably warm Northern Hemisphere winters. Where at the Hemispheric center of the this heat lies a cold zone. Like theoretical Hadley cell model, at the Pole lies an Upper Low, of which there is a cold high pressure. This Cold North Pole, places itself by a confluence of planetary wave alignments. It may be in Siberia one year, or Northern Europe the next. But at its center is a significant cold zone. For those not visualizing this, I suggest watching the famous climate fiction film the "Day After Tomorrow". Of which massive cyclones cover the Northern Hemisphere entirely (impossible). The idea of which temperatures at the middle of these cyclones are mortally cold (equally implausible) with the air coming down from the stratosphere too fast (if air descends its temperature rises). But the idea of a single cyclone , spanning the entire Northern Hcmisphere is more in line with a cold temperature Pole, of which all circulation around it is counterclockwise (planetary waves), of which also at its center is the lowest point of the Tropopause (the vertical area between the troposphere and the stratosphere) , a place where there is a cloudless eye, which facilitates the cooling of a much thinner lower Troposphere. The recent days after the long night seems to fit this rather different Polar weather feature. At +1.35 degrees C, 4th month in a row above 1 degree compared to the 1951-1980 NASA Gisstemp mean. Prediction success strikes early again, this time with a difference, I am very satisfied that the Southeast US temperature anomaly is virtually identical to 2005 here , as with April 2007, here . This is one of the first times where planetary waves react almost identically with refractive temperature profiles as you can see below, it is not a coincidence but rather a pattern picked up by the long range capacity to decifer trends by sun disk observations. Breaking another barrier is exciting, but the results are worry some, if everything unfolds as expected the hurricane season weather map will start very similar to 2005, but with extra heat in the atmosphere, so it is not quite the same, something for hurricane experts to mull over. Vertical diameters are a well established prime signal in tropospheric temperature trends, recent results are for the warmer once again, even when it is very cold on the surface, sun disk sphericity proved larger, describing the entire troposphere weighted temperature trend. From a total 400 observations. 200 since very cold mid-March didn't change the percentage trend much...There are already signs of record warming all over the world. - Majority of Sunsets earlier, an apparent starting trend. - Will there be a smaller but very persistent cold zone at every winter end? First some news: North American weather especially the US Northeast Coast eerily similar to 2005, as I recall cooler at this time of the year. As mentioned previously, March 2007 was coldest in years locally, nothing moved, and it was an excellent time to observe. A soon as the cold air mass left Southwards after a strong blizzard, sun disk observations showed enormous gains in heat which got even warmer in 7 days (ending yesterday). The mixing was key, but it was the rebound which was indicating how warm it was. A similar a little weaker rebound was measured in April 2005, this means planetary wave circulations are very similar to 2005. For now, I’ll be looking for signs of cooling, coming from somewhere else is always possible in April as seen in previous years. Expect an end of April update with more elaborations. Northern Hemisphere temperature projection, summer of 2007: Warmest in history, with cooler mid spring for most of the North American sector. Last year at this date I observed an area of very cold air exactly at the opposite side of the Pole, wondered what data this air mass might give. March just past gave me the opportunity to see just the same event, the sides of the Pole reversed, its North America’s turn to be colder, but only briefly, the rest of the world is warmer. The shock just past of Siberia not being the deepest freeze in the world means just that, North America’s last cold air stand will fail with warmer air from Russia. During March, a wide window of clear air covered much of the Canadian Archipelago, a stable conduit of heat radiation cooling to space went virtually unhindered, rendering the rising sun warming irrelevant. What was this? A zone of cooling, even with the warmest winter in history, there was one. All I monitored was a continuous monotony of very cold air, dipping a little by mid March, it is actually impossible to predict the future in such circumstances, when mixing occurs anywhere but here, this is why no projections were given. It took a 2 day blizzard to reintroduce Resolute to the rest of the weather world, the wait was not disappointing, a strong upward surge in heat was measured, indicating a climatic sensitivity recoil from zonal interchanges. Stand by for a formal projection, So far it looks a lot like the Spring of 2005 with more heat added, 2005+. Some may find it odd that temperatures have finally reached a semblance of winter, this cold being a memory eraser, came very late progressively from a very warm start. All indications are that there will be a warm spring, now that the Upper Air has cooled from a warmer level too, it is at a warm starting point, temperature wise, February Upper Air rivals 2005 and 06. 2005 being the warmest year in history will now get seriously challenged. The combined months of the last Dec-Jan-Feb were the warmest in history. It is hard to imagine a scenario which will bring down this #1 ranking at year end of 2007. This is why I observe sun discs, it is to see if cumulative cooling (or warming) process have reached their peak. There was a very cold few days just past, I was astonished by the lack of compressing represented by the surface air, it came from cumulative cooling windows mixing which lasted about all winter, even with 46 C, sun discs were abnormal in their size, meaning warmer air aloft was still somehow around, with the cold air sliding under towards the South one furious last time. These results were astonishing, but not unique, I have seen this before. Not really understanding it, this fascination triggers even more awe to what is still unknown. El-Nino Mortuus et tu Arctous? News of the demise of Moderate El-Nino has not exactly sent shockwaves throughout the world of weather. But it is highly likely not the culprit in present world wide warm winter conditions, it is no longer the perennial scapegoat, and must leave experts wondering what is causing this winter warm spell. Look no further than the Arctic, as it is drastically warmer in most of its regions. Perhaps El-Nino will now be considered as a regional event caused by particular planetary wave positions, rather than the event causing drastic weather changes in many locations of the world. 2007 spring projection. What's the score? Early data is in, from 20 observations, it is customary to send news from the atmosphere thanks to the sun. Average or single compression sizes 27%-24%-17% for 2005-06 and 2007 respectively (1 to 5 degrees). 2007 wins. More importantly, it is early, the sun disc sizes will expand further. Making the spring of 2007 warmer than the previous 2 already well known years. Another nascent method is still showing greater heat level for the beginning of 2007 as well. This to be outdone by Northern Hemisphere anomaly of +1.71 Click here. A truly great departure from the norm. In complete agreement with sun observations of October 2006, which showed extreme sun disc expansions during a high Arctic heat wave which defied logic. I've noted several dissimilarities with the winter 0f 2005-06, namely the apparent lack of cold air in central Russia, a very big surprise, again logic begets. But also the atmosphere proper was unusually warm to start with, and stayed that way, with a more or less consistent cooling rate. However if the atmosphere cools from a higher state of energy, it will stay at a higher temperature until something dramatic , a greater window to space happens. NEWS from the sun, Resolute sunrise seen February 4 2007, ending the long night, but with a weak sunset of -1.3 degrees. Indicating lack of upper air cold air, confirming that it may be relatively cold on the ground, but the upper atmosphere is unusually warm, the very source of this heat, is from above. The Main Difference between December 2006 and December 2005, is a shift in planetary waves, shifting the cold zones Eastwards, which compared to 2005, means that the cold North American zone of December 2005 shifted to the very warm Atlantic, while 2 other cold zones shifted from Werstern Europe in 2005 to Midle East -North Africa in Dec 2006, from Central Siberia in Dec 05 to the North Pacific in 06. In other words, these shifts favored a planetary warming very much. But the Arctic warm spots remained almost identical from December 05 to December 2006. Which is the driving force behind all this warming. Not just El-Nino, which is part of a larger planetary longitudinal shift in cold and warm mega zones defined by their pressure and temperature anomalies. Atmospheric heat remains even in darkness, it cools to space whenever there is a window of cloudless skies, if this window is shut, when its very cloudy, the heat remains in a near constant flux at the lower troposphere, which slows the effects causing winter. The clouds main "raison d'etre" water vapour, and super cooled water dropplets have had a huge impact, along with a warm atmosphere which should be cooling given the proper window, for things to return to normal, moisture levels must drop, and the planetary cooling windows must be very large and long lasting.